Fruit Cocktail Graham Float with delicious layers of sweetened cream, graham crackers, and fruit cocktail is the perfect dessert for all occasions. 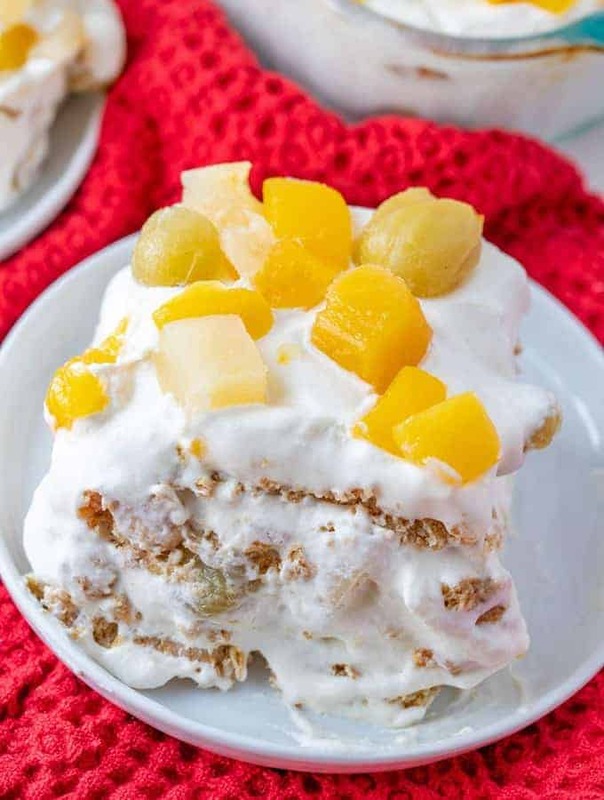 This refrigerator cake is so easy to make and is sure to be a crowd favorite! We went on a two-week trip to Northern California last holiday season and I wasn’t able to work on Christmas recipes on time. In fact, I posted this fruit cocktail graham float last year a day before Christmas Eve which was, of course, a bit late. 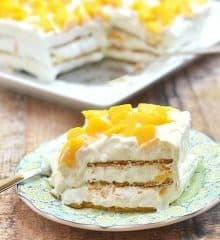 This icebox cake needs a good few hours to set in the refrigerator, I doubt you guys were able to make it in time for Noche Buena. Ugh, such a shame because it’s so, so, so yummy! I am reposting the recipe today with brand new photos to give it the limelight it deserves. 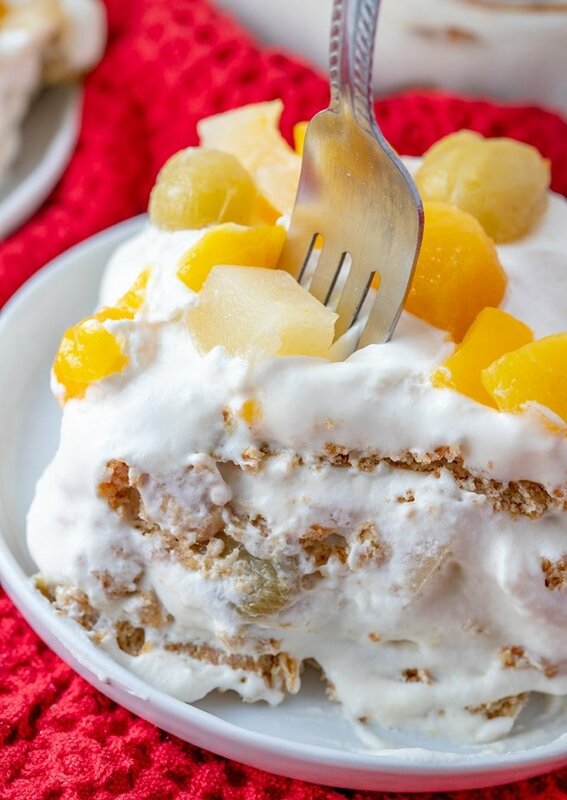 With delicious layers of graham crackers, sweetened cream, and fruit cocktail, this fiesta float is an amazing dessert to ring in the holidays. But although no-bake graham cake is traditionally served on Christmas, it is also the perfect sweet treat to make during hot summer months when you don’t care to have the oven on. Don’t let the lack of a special holiday keep you from enjoying this scrumptious dessert, it’s a fabulous addition to any meal year round! Use a square baking dish that is deep enough for the multiple layers plus at least 1 inch of headspace so the top cream layer doesn’t stick to the film when covered. 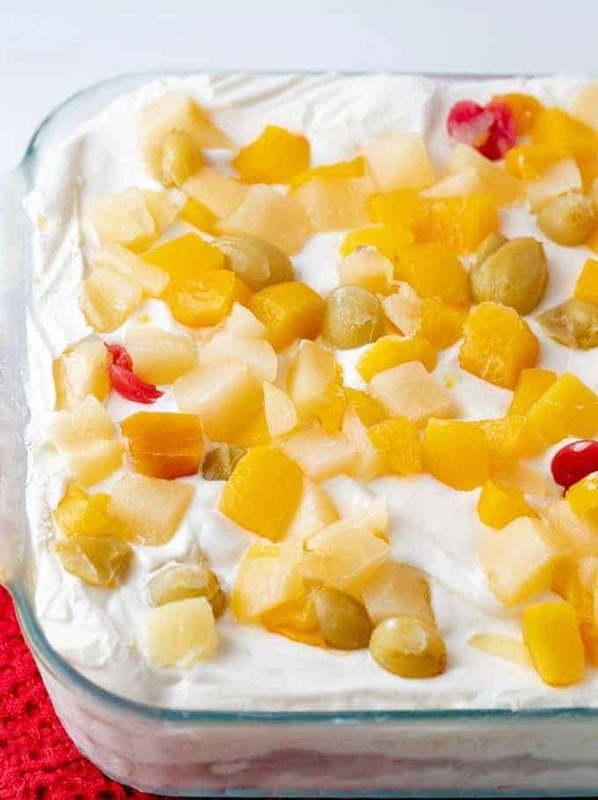 Make sure to drain the canned fruit very well to keep the extra liquid from seeping into the cake. I used Nestle’s all-purpose cream but heavy cream will work as well. Make sure the cream has at least 30%milk fat content for sturdy foam and better peaks. For maximum volume, chill the cream and condensed milk until very cold. You can also chill the bowl and the beaters in the freezer for about 20 to 30 minutes. You can swap the graham crackers with broas (lady fingers) or digestive biscuits if you like. Want to try another fruit? Canned peaches, sliced fresh strawberries or mangoes are delicious alternatives! 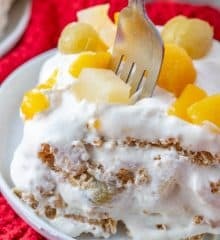 This fruit cocktail float is a super easy route to a super yummy dessert but if you’re in the mood to go all out, may I suggest this crema de fruta with a from-scratch sponge for your next baking project? It’s almost Christmas, everyone! I hope you’ll check back here often as I add more delicious meal ideas for Noche Buena and Media Noche. In a large bowl, combine all-purpose cream and condensed milk. Using a hand mixer at low speed, beat mixture until it begins to thicken. Increase speed to medium and continue to beat for about 8 to 10 minutes or until double in volume. Arrange one layer of graham crackers on the bottom of an 8 x 8 dish, breaking pieces as needed to fit sides. Spoon 1/3 of cream mixture on graham crackers and spread to cover. 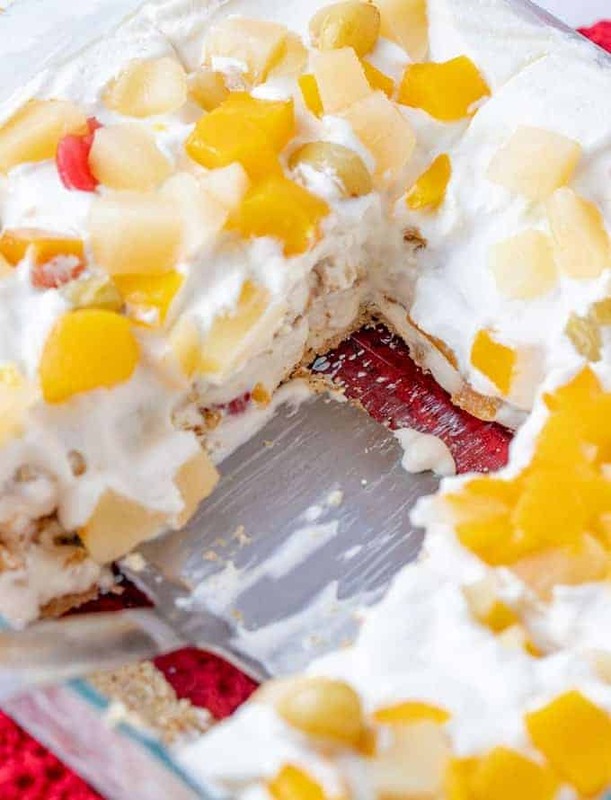 Arrange fruit cocktail on top of the cream. Arrange another layer of graham crackers over the fruit. Spoon and spread 1/3 of the cream mixture. Add another layer of fruit. Arrange the last layer of graham crackers on top of the fruit. Spoon and spread remaining 1/3 of the cream mixture on top of crackers. Arrange the remaining fruit cocktail on top of the cream. Cover tightly with plastic film and refrigerate overnight. Freeze for about 1 hour before serving, if you like. I would like to see suman recipe on video if possible and pan de coco. thanks.